ROME, December 11, 2013 (Zenit.org) – In his latest book Tea Party Catholic, Dr. Samuel Gregg develops a Catholic case for the values and institutions associated with the free economy, limited government, and America’s experiment in ordered liberty. He underscores the moral and economic benefits of business and markets, addresses the welfare state’s problems, and deals with related issues that divide Catholics in America such as the demands of social justice, the role of unions, immigration, poverty, and the relationship between secularism and big government. 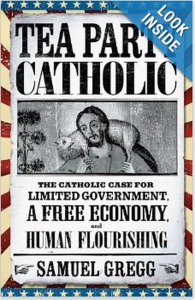 Gregg concludes that as a creative minority, limited government Catholics can help transform the wider movement to reground the United States upon the best insights of the American Experiment—and thereby save that Experiment itself. Director of research at the Acton Institute, Gregg spoke recently with Giovanni Patriarca about the book. Click here to read the whole article on Zenit Catholic News.